Vocabulary Bingo at the DIF School. An excellent way to review Little Reader vocabulary! The students at the DIF school where KKIS volunteers are now working spent a day playing Bingo with their vocabulary words this week. It is an excllent way to review vocabulary! 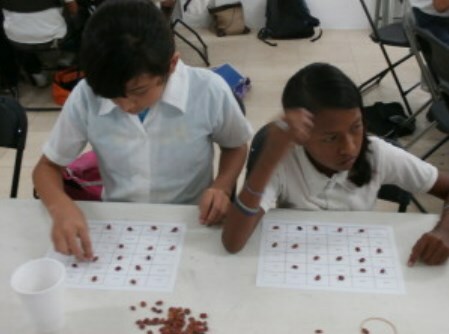 We printed Bingo cards with 25 words they have learned from daily use of the English language Curriculum by Brillkids called Little Reader, which is a part of a Scholarship by EEECF through LLI-Mexico. The volunteers held larger images representing the words and called them out one at a time as the children covered their word boxes with dry pinto beans. Soon there was a winner at one of the tables and many more followed. A bag of piñata candy served as prizes for the winners and was shared by all at the end of our time together. Their progress is remarkable as most of these children knew no English at all when we began introducing this program about a month ago. One can see in the photos that each child recognized many words and covered their bingo card. We spend time with these students both Tuesday and Thursday from 11 – 12. If you would like to join us please get in touch! Follow Little Learner Initiative Mexico’s board DIF SCHOOL-KKIS PROGRAM on Pinterest. This entry was posted in Mexico and tagged BrillKids, Children, Foundation, institutions, Joy Koller, KKIS, Little Learner Initiative, Little Reader, LLI, Mexico, Mission, school, students. Bookmark the permalink.